The Derbyshires were a glassmaking family based in the Manchester area. The firm was first established in 1858 at City Road, Hulme, and was known as The British Union Flint Glass Works. By 1868, there was another factory at Trentham St, Hulme, which was run by the brothers James, John and Thomas. It was during this period that the first designs were registered which can be attributed to the brothers and to Hulme. These items are quite rare. They traded under the name of J.J. & T. Derbyshire until 1873, when John left. John Derbyshire set up the Regent Road Flint Glassworks in Salford. It traded for 4 years under this name, during which time the trade mark was used. 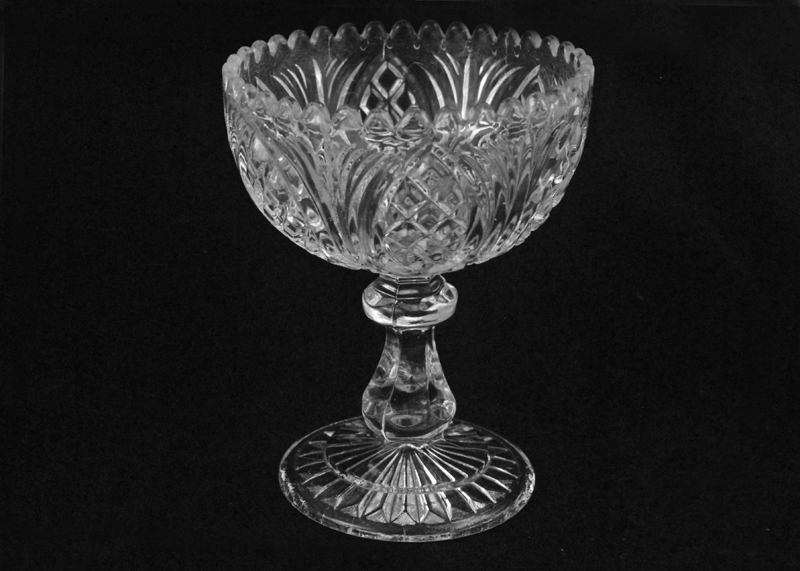 In 1876 the firm was renamed Regent Flint Glass Company. In August 1873 John Derbyshire registered his first design: goblets which have the pattern number underneath the trademark. The most successful design was registered on 3rd July 1874, which was a paperweight in the form of a lion, and which was produced in clear, frosted and coloured glass. In 1876, there was a winged sphinx paperweight, produced in frosted, flint and black glass. In September 1874, there was a greyhound paperweight, and in November 1874 a figure of Britannia. The design for the Punch and Judy pair of figures was not registered, but they are trademarked. There are no more designs registered after 1876. The parent company became James Derbyshire and Sons, and by the 1880s is also listed at Regent Road Works, Salford. An anchor superimposed on the letters J D used between 1873 and 1876. Sugar, with pineapple design, trademark and diamond. 8th Aug 1873. 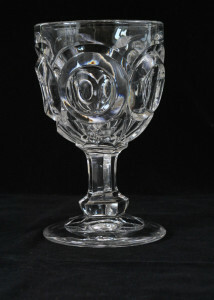 Goblet with single row of ovals. Trademark and number 248. c.1873.